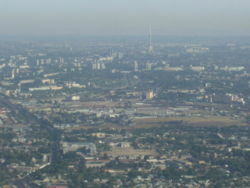 Tashkent is the capital of Uzbekistan and also of the Tashkent Province. The officially registered population of the city in 2006 was 2.1 million. According to unofficial data, the population is more than 3 million. In medieval times the town and the province were known as "Chach". Later, the town came to be known as Chachkand/Chashkand, meaning "Chach City." (Kand, qand, kent, kad, kath, kud--all meaning a city, are derived from the Old Persian, kanda, meaning a town or a city. After the 16th century, the name was steadily changed slightly from Chachkand/Chashkand to Tashkand, which, as "stone city", was more meaningful to the new inhabitants than the old name. The modern spelling of Tashkent reflects Russian orthography. This page was retrieved and condensed from (http://en.wikipedia.org/wiki/Tashkent) see Wikipedia, the free encyclopedia, March 2008. I do not usually comment about hotels and other services we encounter during our overseas trips. Firstly because the services we get usually doesn't worth commenting about and secondly I do not get paid for advertising the Hotels and other services. However we had the usual hassles with Taxi drivers and hotel agents etc. on our arrival to Tashkent. After a lot of hassles we found a quiet and helpful Taxi driver and we used him to visit Bukhara, Samarkand and Tashkent as well. I am a real softie sometimes, one unguarded moment I promissed this chap, that I will mention him on my page. He was nice, helpful and oblidging, until he took us to the airport on our departure and charged us about ten times what he or they would charge the locals for the same service. Tashkent International Airport (Uzbek: Toshkent Xalqaro Aeroporti) (IATA: TAS, ICAO: UTTT), is a main international airport in Uzbekistan located in the capital Tashkent. The airport serves as the hub of Uzbekistan Airways. This page was retrieved and condensed from (http://en.wikipedia.org/wiki/Tashkent_International_Airport) see Wikipedia, the free encyclopedia, March 2008. A few of the so, so photos I took of the buses plying the streets of Tashkent. I like to photograph buses, although the whether and the buses never learnt to co-operate with my wishes, well there goes the team-play, huh? further down this page I have some trams and trolley buses as well, well the same applies to them too.